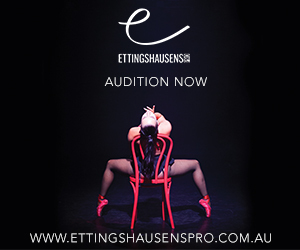 CERT IV in DANCE - Ettingshausens PRO provides you with the best mentors in the Performing Arts Industry. Studying at Ettingshausens PRO in 2019 will place you at the forefront of dance education, giving you the tools and skills to launch you career in the Performing Arts Industry. Our boutique course provides limited spaces, ensuring you receive the individual attention and guidance you need to discover your true potential. CERT IV in DANCE TEACHING & MANAGEMENT - Ettingshausens PRO has 24 years in studio management and teacher development. As a leader in the Industry, our CUA40313 Certificate IV in Dance Teaching and Management course will prepare you for real life scenarios in the dance studio environment, as both a teacher and manager. Whether you want to become a world class choreographer, run events or run your own studio, Ettingshausens PRO provides you with the training and opportunities to be prepared for your career. Subjects: Acrobatics, Acting, Audition Technique, Ballet, Broadway, Career Management, Choreography, Commercial Jazz, Contemporary, Fitness, Hip Hop, Jazz, Latin, Lyrical, Musical Theatre, Modelling, Nutrition, Pilates, Singing, Tap, Technique, Working in Heels, Dance on Camera. Teachers: Kelley Abbey Rosa Agius, Jo Ansell, Matt Antonucci, Cassandra Bartho, Jo Bolden, Julian Caillon, Carly Cooper, Natasha Crane, Kieran Crowe, Michael Dameski, Samantha Dodemaide, Michael Ettingshausen, Tammi Gissell, Jordan Grant, Troy Harrison, Gaynor Hicks, Keith Hawley, Sophie Holloway, Kate Larter, Robbie Kmetoni, Tobias Madden, Steph Magiros, Natasha Marconi, David Mclean, Tim Moxey, Jake Murray, Marko Panzic, Adam Parson (USA), Eden Petrovski, Aimee Whittaker, Thern Reynolds, Cat Santos, Michael Stein, Sarah Stollery, Stephen Tannos, Chris Tsattsilios, Jade Westaby, Blake Wood, Christina Woodard (USA), Neale Whittaker, Kaylie Yee.